Human beings are hard wired for connection. And never will you know that so much as when you start your own business, do creative work that requires periods of solitude, or become a new parent. All of these scenarios can bring on cravings for company and cake. 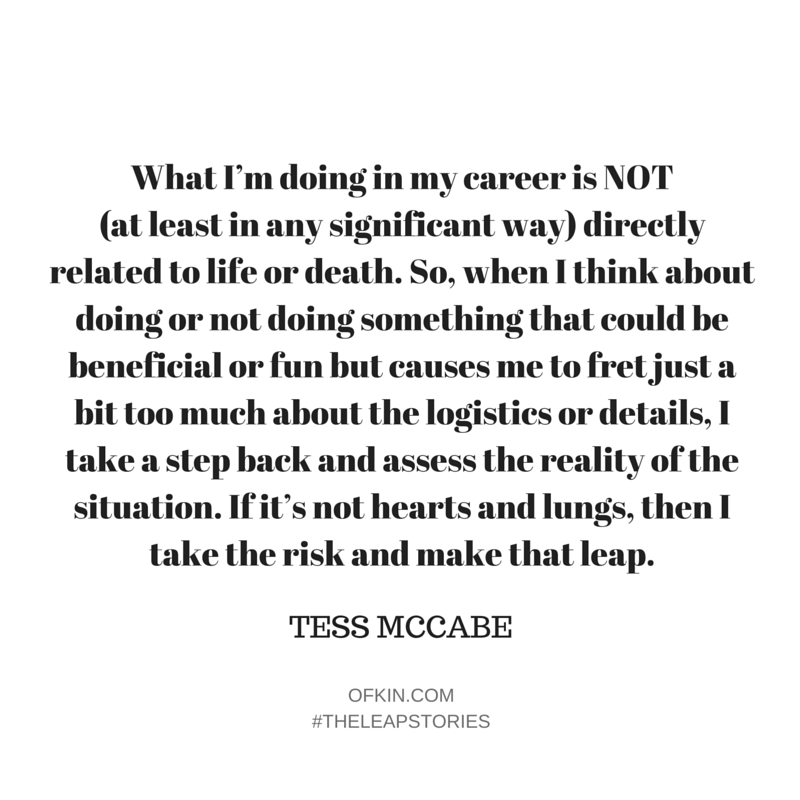 Thankfully, Tess McCabe’s working life is all about helping creative minds connect with each other to share industry knowledge, war stories and tips on the work/life juggle, sometimes over morning tea, sometimes via a book and sometimes via digital airwaves. Tess is a graphic designer, founder of publishing company Creative Minds (Owning It, Conversations with Creative Women I & II, Graphic Design Speak), half of parenting podcast The New Normal, and president of the Creative Women’s Circle. She is quite honestly one of the most prolific multitasking people I know, not only due to her own wild talents, but because of her lust for bringing like minded souls to work together. 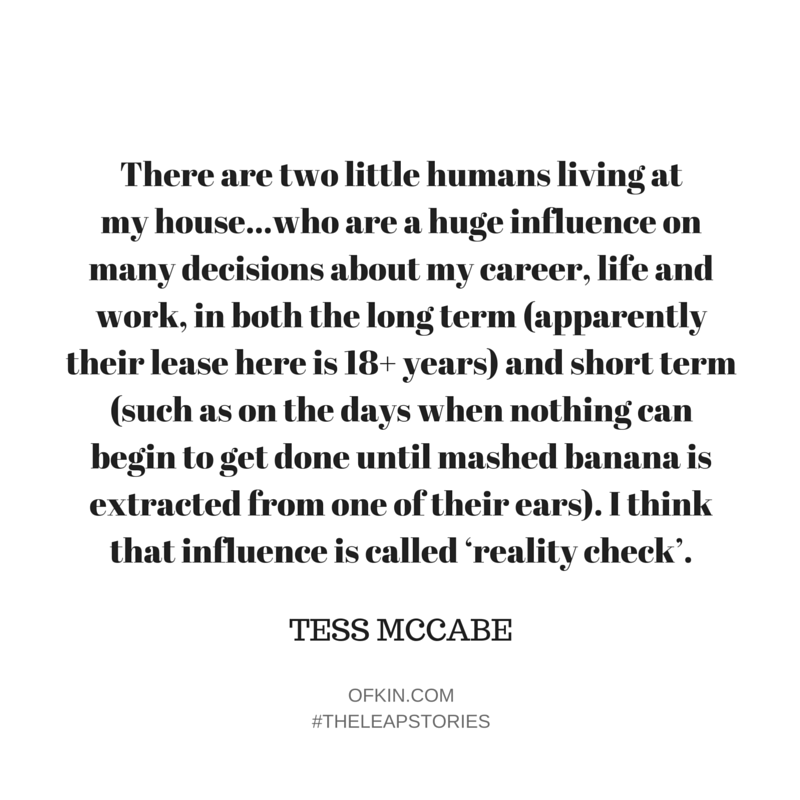 Tess’ leaps help us plug into a creative community around issues that make us smarter, more empowered and connected with people who care about the things we do. It’s not just good business sense, it’s a purpose for living. GIVEAWAY! Tess has kindly offered a Creative Minds book pack to one lucky Australian reader! Simply leave a comment below (or on Instagram) and tell us about a great book you’ve read lately. Entries close midnight Friday 12 February 2016. Good luck!! Gorgeous Tess, multi-creative, graphic designer, publisher, mum and founder of Creative Women’s Circle and Creative Minds. Photo by Shannyn Higgins. For the majority of my childhood, my standard response to that question was ‘either an architect or a fashion designer’. Clearly, I wanted a career that melded rational thinking and problem solving with making stuff look nice. When I discovered graphic design (and FONTS!) at age 14, I was set on that path. Having said that, recently I remembered that in high school I had a fleeting interest in pursuing a career in radio. Perhaps that is why in 2014 I started a podcast, The New Normal, complete with a co-host and hilarious banter (but minus the top 20 countdown). It fulfills that long-held little career sub-dream. Straight out of high school I studied at Griffith University’s Queensland College of Art, a 3 year Bachelor of Design Studies. It was fine, but after being so focused on the pursuit of that career for so many years, I couldn’t wait to get out of the education system and start doing the work. Nowadays, I learn on the job, learn from mistakes, learn from other people’s mistakes, learn from successes, and I am always observing (which I guess is it’s own form of study!). 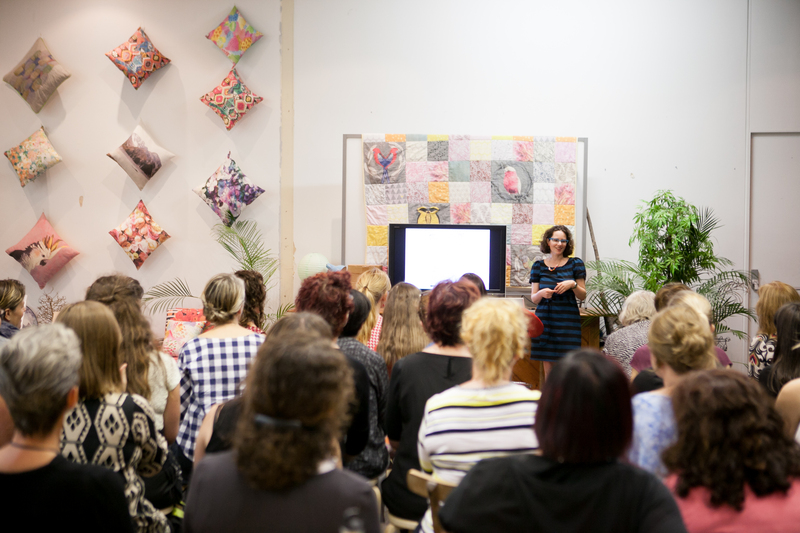 An inspiring Creative Women’s Circle event. Photo by Martina Gemmola. In recent years, there have been two. The first, publishing (read: developing, designing, co-editing, author-managing, funding) a giant guidebook about legal stuff for creative people called Owning It. It was one of those projects that seemed naively achievable at the outset, but evolved into something much bigger and quite different (yet ultimately better) as the project went along. There were many times when I felt truly in over my head and overwhelmed. 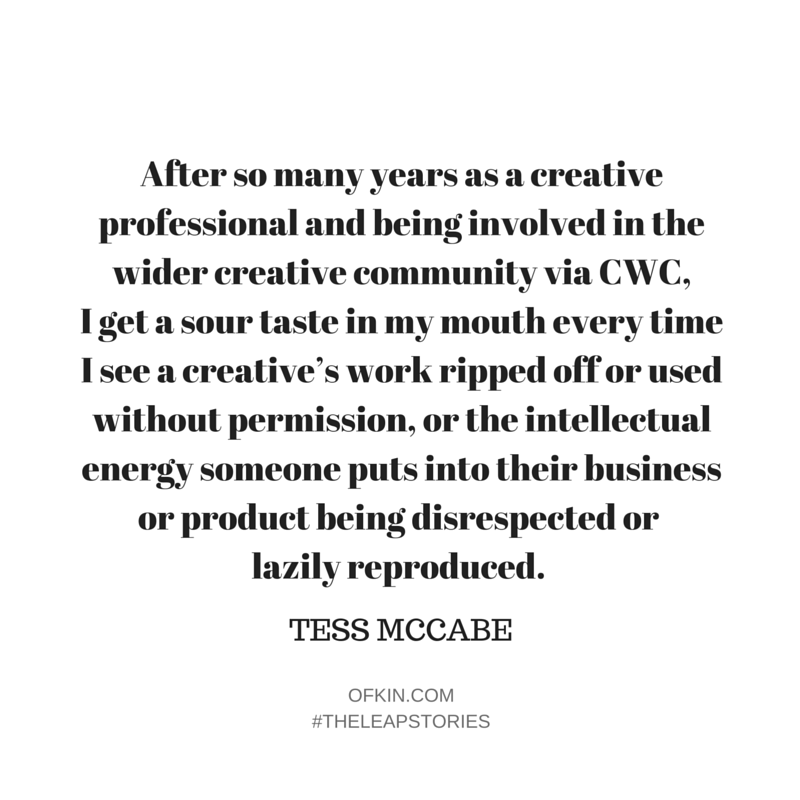 The second leap was turning an arm of my business, Creative Women’s Circle (CWC), into a non-profit association, in order to make it a sustainable business that did what it should do for its customers in the best way possible. Prior to a few months ago, I ran CWC pretty much on my own and its revenue made up a modest portion of my overall income. Now, I am its current president and a volunteer like the rest of the awesome board and subcommittee of members. 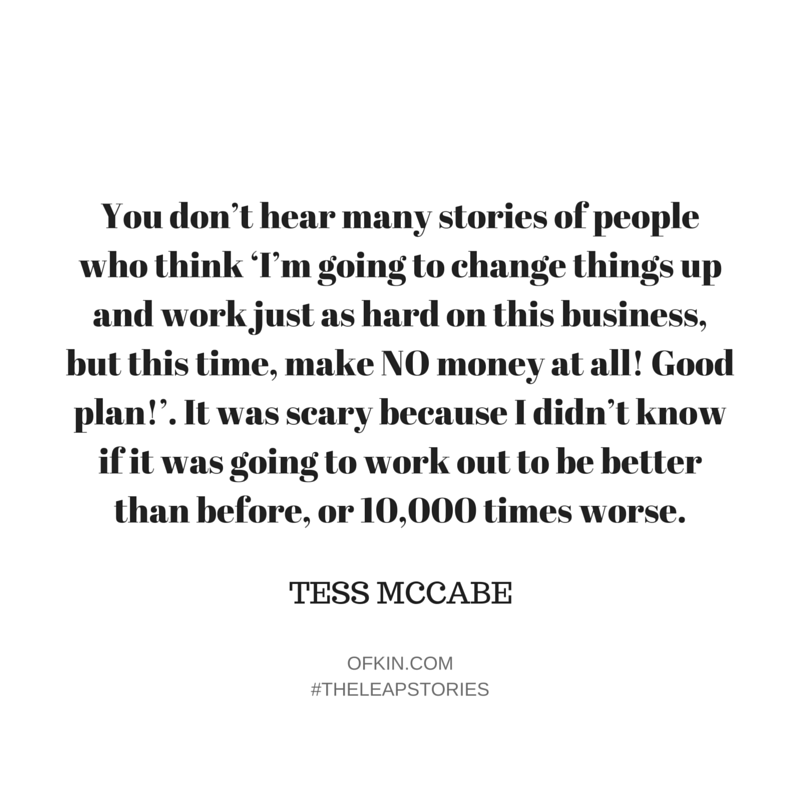 You don’t hear many stories of people who think ‘I’m going to change things up and work just as hard on this business, but this time, make NO money at all! Good plan!’. It was scary because I didn’t know if it was going to work out to be better than before, or 10,000 times worse. Prior to Owning It I had published three of my own books – Conversations with Creative Women (volumes 1 and 2) and Graphic Design Speak. I had also worked in large publishing houses as a graphic designer, and run my graphic design practice solo for eight years. I published those books under the umbrella of CWC, which I had been managing mostly by myself for six years. While I had a team of wonderful contributors writing for the CWC blog, and people starting to run CWC events in other cities under my direction, and assistance at the events I ran in Melbourne, everything from the strategic direction to the daily minutiae of CWC was just me. My immediate family’s skills and interests had a strong influence on me growing up. My parents, siblings and I were always surrounded by, and interested in, books, music, art, craft and writing. I was never discouraged from following the inevitable path toward a career in design, nor starting my own business, nor publishing my own books, and that was in part thanks to the fact that my parents are involved in a combination of those things professionally, and have always been supportive if they can see we have confidence and conviction in what we are doing (as well as some semblance of talent to back it up!). My husband and close friends are all creative people. Some days, I wish someone in my inner circle was a GP or an accountant, or an electrician or a plumber – you know, skilled labour! But they provide a constant source of support, inspiration, understanding and advice, which I guess is worth more than paying a high call-out fee on a Sunday. Day-to-day, I’m influenced by random things I’ve heard or read or seen that relates to how a person achieves what they have set out to do. 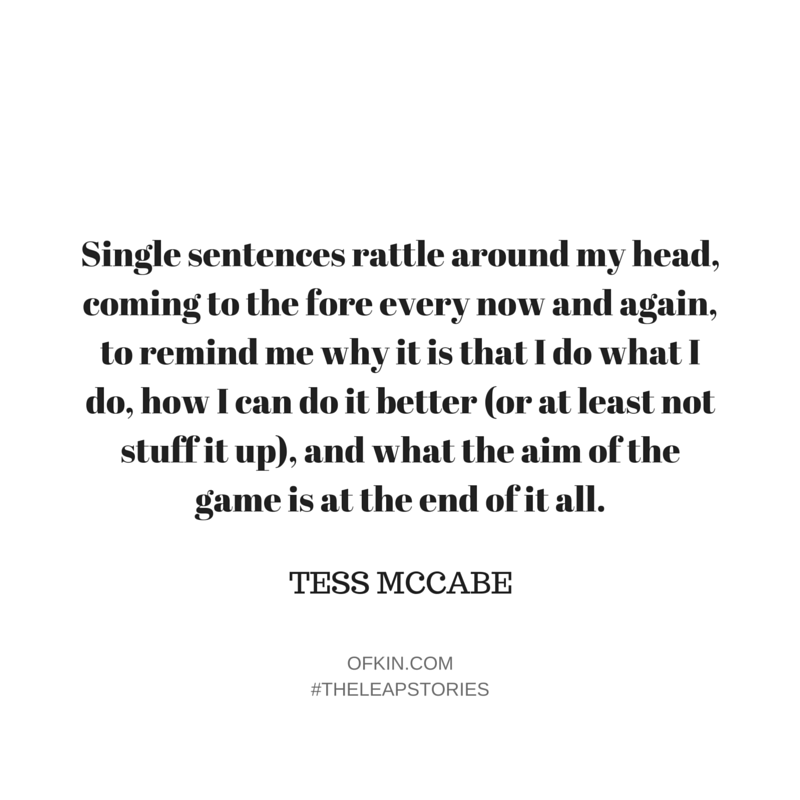 Single sentences rattle around my head, coming to the fore every now and again, to remind me why it is that I do what I do, how I can do it better (or at least not stuff it up), and what the aim of the game is at the end of it all. Lastly, there are two little humans living at my house and eating most of my food, who are a huge influence on many decisions about my career, life and work, in both the long term (apparently their lease here is 18+ years) and short term (such as on the days when nothing can begin to get done until mashed banana is extracted from one of their ears). I think that influence is called ‘reality check’. Before publishing Owning It, I had a background in book publishing, a game plan for the book (even when the goal posts kept moving! ), and an inner circle of support from friends, family and the creative community the book was written for. With CWC, the structure of the business was already very similar to a non-profit association model, just without the woman-power of a governing board. After so many years as a creative professional and being involved in the wider creative community via CWC, I get a sour taste in my mouth every time I see a creative’s work ripped off or used without permission, or the intellectual energy someone puts into their business or product being disrespected or lazily reproduced. The idea for Owning It was born from a discussion with the book’s author, Sharon Givoni. As a lawyer, Sharon works to defend the rights of creative people every day, in cases that could largely have been avoided if only creatives were educated about the basics of intellectual property law in the first place. So the ‘I can’t do this anymore’ moment was more of a ‘why isn’t anyone doing anything to help educate us/them about our legal rights’? Being a do-er, I couldn’t help but make a plan to try and fix it and fill that knowledge gap for my creative friends and colleagues. With CWC, the ‘I can’t do this anymore’ moment was different and more elongated. After having my first child, and developing books while running my graphic design practice, I had felt like I was not able to give the CWC community everything that it deserved, or implement all the goals and plans I had all on my own. I realised, sadly, that CWC was not sustainable unless a) I undermined my own value system and started making changes I wasn’t comfortable making, or b) a massive shift in its structure took place. And I needed it to survive because, frankly, I’m a creative woman in business who craves the support and connection CWC provides as much as any of its members! Often times I feel that my job is to mediate both sides of my brain into an amicable agreement. 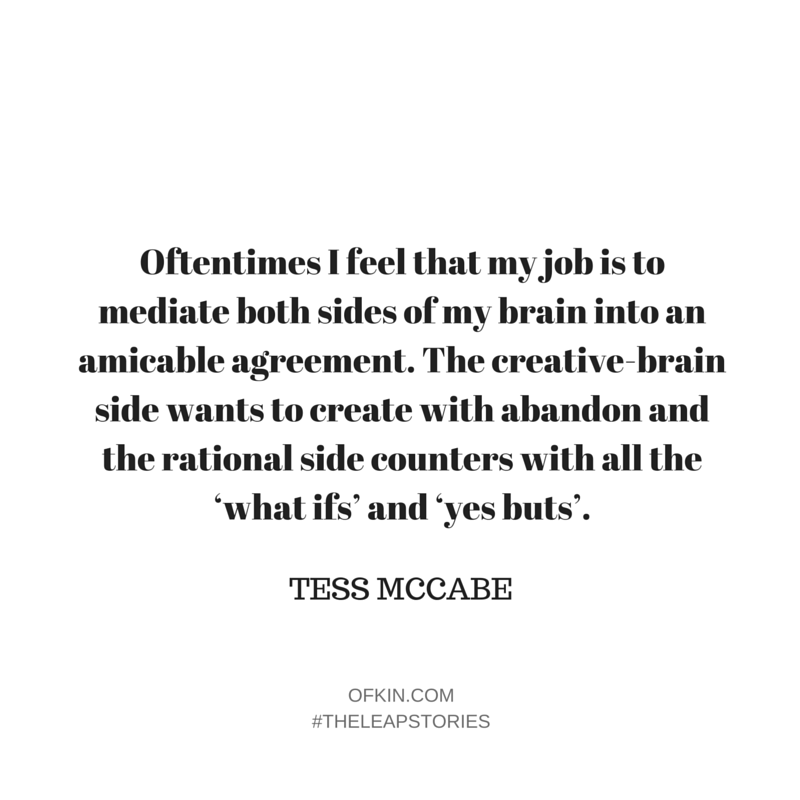 The creative-brain side wants to create with abandon and the rational side counters with all the ‘what ifs’ and ‘yes buts’. So my tactic is to think of all the potential risks associated with the leap, and formulate plan B (and C and D) in the event of setbacks, failure or falling short. Once those plans are thought out, unless forging along with an idea spells certain doom (which to me would be things like family breakdown, financial ruin, public shame, death etc – pretty drastic scenarios!) then I always choose to DO. Here’s a random story with a point. Years ago, a former manager gave me client feedback to implement on an urgent graphic design job early in my career. Lamenting the client’s insistence on the importance of the change and urgency, she commented ‘I mean, really, it’s not hearts and lungs’. Hearts and lungs. True, right? What I’m doing in my career is NOT (at least in any significant way) directly related to life or death. So, when I think about doing or not doing something that could be beneficial or fun but causes me to fret just a bit too much about the logistics or details, I take a step back and assess the reality of a situation. If it’s not hearts and lungs, then I take the risk and make that leap. All my books have been self-funded, with Owning It partly funded from a loan. One thing about books is that there is a precedent for customers to pre-order a book before it is officially released, and the major expense with books is usually printing, one of the final steps of the production process. So I’ve always tried to make it that the largest upfront cost is paid for by the first burst of customer orders. Not that book design isn’t expensive (it can be) but by being a designer, I feel I have a slight advantage over a publisher who also needs to pay for that service. Having said that, my short bitten fingernails disagree that it is a good strategy – after four books I’ve only just learned what a P&L (profit and loss) statement is (!!! ), so next time around I’m really going to make sure the numbers add up before I dive in and pay myself $2.85/hour to design a book. Leaving salaried employment to work as a freelancer/independent graphic designer was my first pretty big leap, and it definitely beget the other leaps. See certain doom, above. But rationally I know that many of the life-altering things that happen to people aren’t planned and disasters don’t discriminate. So I try to just get on with it (and in times of insomnia, design my dream home office in my head). 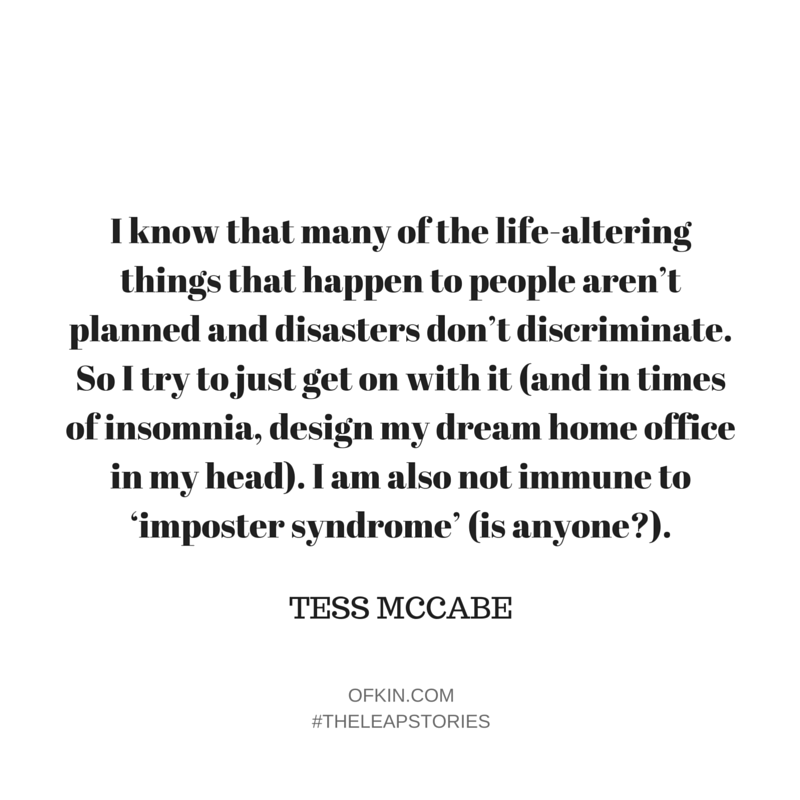 I am also not immune to ‘imposter syndrome’ (is anyone?). The first few months with the CWC Board have been fantastic. Now, behind the scenes, I’m joined by a team of ridiculously smart women who are all focused on making CWC into an organisation that will have real impact on creative-womankind in this country for years (decades?) to come. I’m looking forward to the next year when we can start getting out there and implementing some of the great ideas we’ve had as a group so far. And despite it being quite hard to actually look closely at my books once they are published (I usually need a year or two break), I am so proud of what Sharon and I put together with Owning It. It was definitely worth the mammoth effort, and as we had hoped at the outset, it is quite tangibly changing the way Australian creative people think about their work and act in their businesses. I am not defined as just one thing. 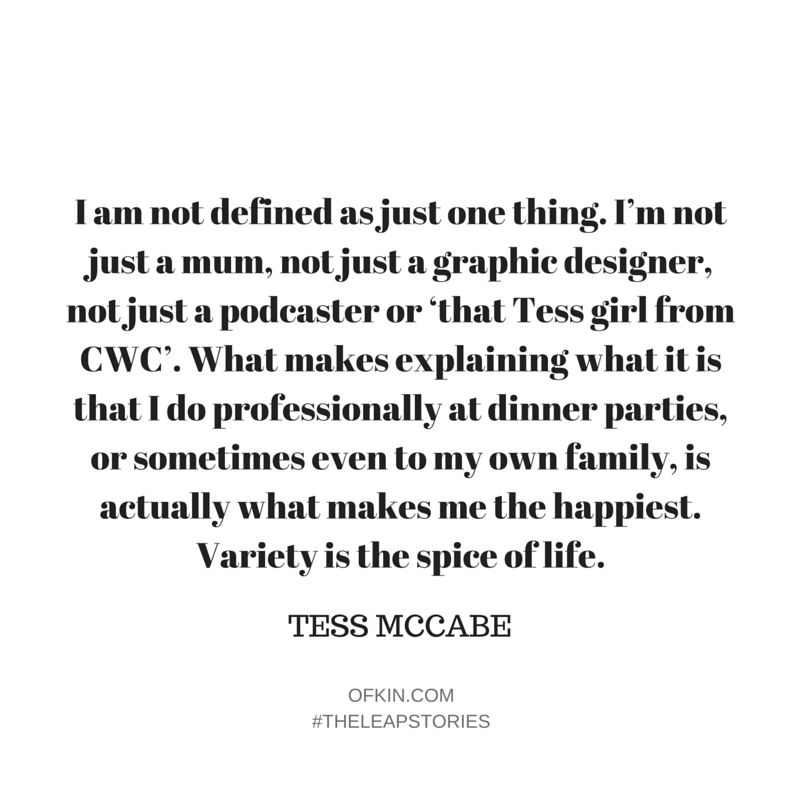 I’m not just a mum, not just a graphic designer, not just a podcaster or ‘that Tess girl from CWC’. What makes explaining what it is that I do professionally at dinner parties, or sometimes even to my own family, is actually what makes me the happiest. Variety is the spice of life. Too many ideas, not enough time/energy/money/resources. But that’s a downside I can deal with. For once I don’t really know, and I actually really like that feeling. With two smalls now, I think my next leap will be a slow-cooked thing. 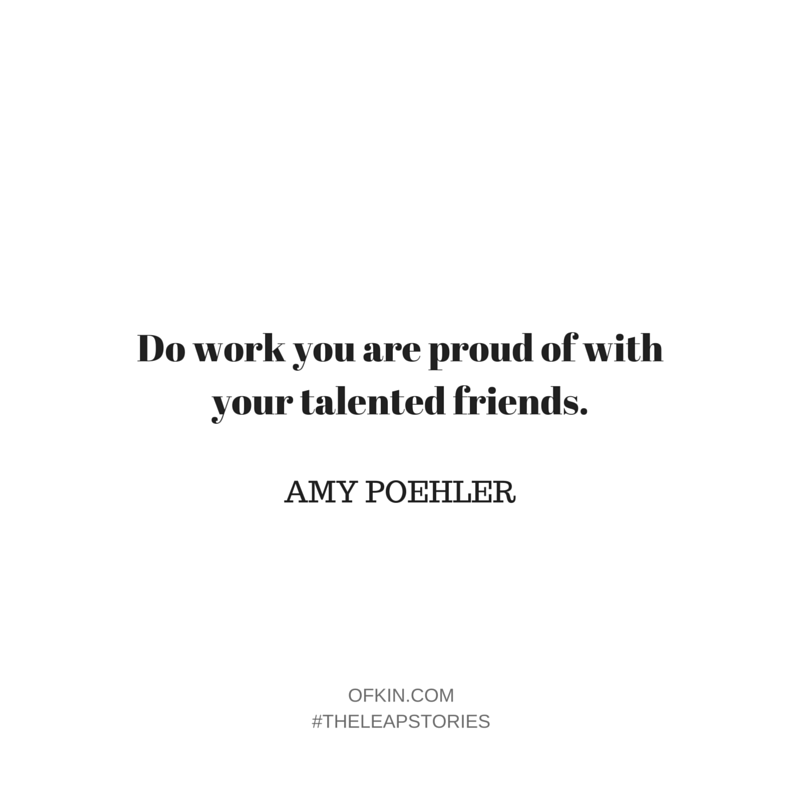 ‘Do work you are proud of with your talented friends.’ – Amy Poehler. I’ve observed the growth of Lucy Feagins’ blog The Design Files since 2008 (she was the first person I invited to speak at CWC in 2009 and I interviewed her for Conversations Vol 1 in 2011), and I am continually amazed and delighted at the direction she takes her business in and the integrity with which she runs it. Every decision she makes feels unique, honest and true to the brand and she’s a damn nice person to boot. 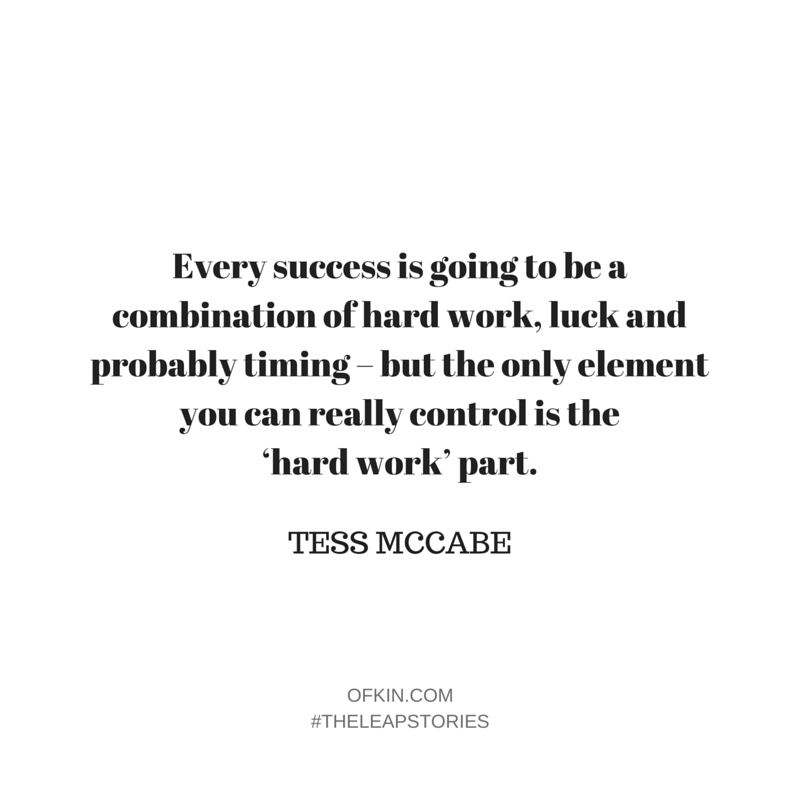 Every success is going to be a combination of hard work, luck and probably timing – but the only element you can really control is the ‘hard work’ part. ps. 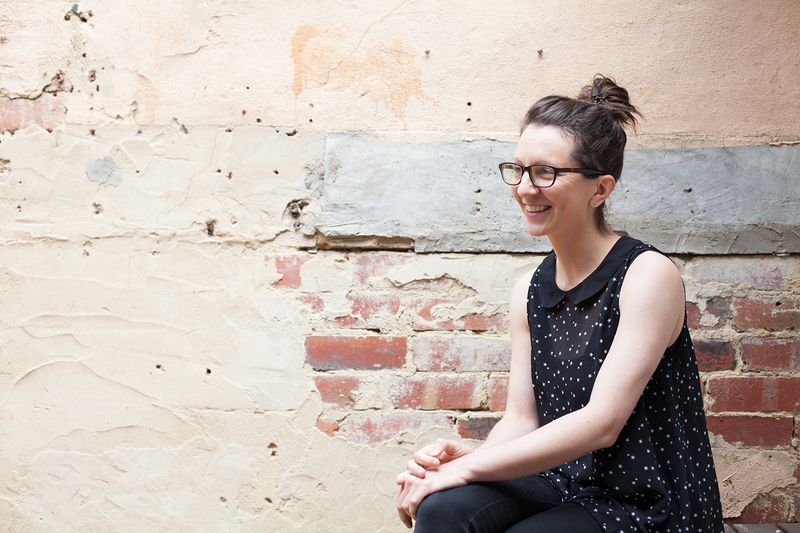 Here’s a podcast interview Tess & Emma recorded with me for The New Normal podcast. You can listen to it here. Early bird tickets close midnight tonight! You know how you say ‘I don’t have enough time to work ON my business?’ or ‘I’m too busy to plan!’ or ‘I’m flat out but don’t feel like I’m getting where I want to be’? Our most precious resources are our time, energy and mental health. 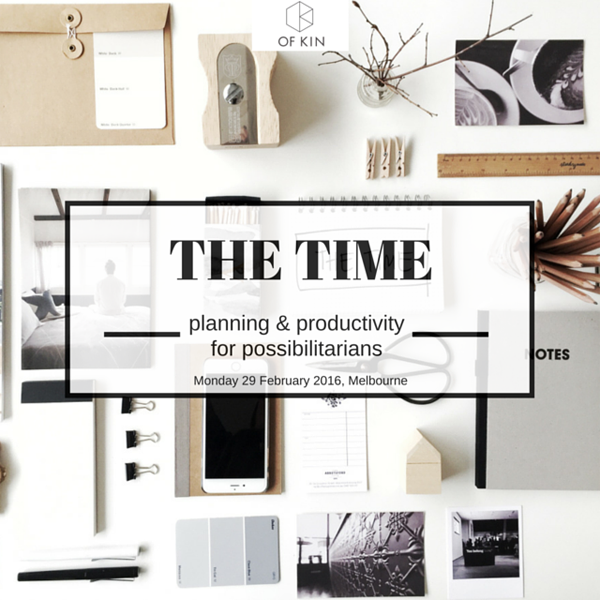 This workshop is specifically designed to create space to think, plan and prioritise your business goals in the next three – six months. Get your business strategy sorted, and create clarity and focus. Think of it as a strategic planning day to get your mind clear on what are your most important priorities coming up, and how you’re going to get them done.